KawaiiPunk - Kawaii Mascot Blog: KawaiiPunk Welcomes Wrong 50th Mascot! You see Ed, it seems that yet again you have overlooked the presence of the much ignored Blank Mascot! As he has clearly been here longer than the Queasy Mascot, and is himself a KawaiiPunk Kawaii Mascot, it is completely impossible for the Queasy Mascot to be the 50th Mascot! He is in fact the 51st Mascot. This means that the actual 50th KawaiiPunk Kawaii Mascot is the Tantrum Mascot. 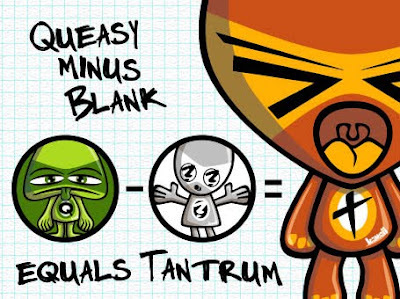 It also means your celebratory post was not two months late but three, as the Tantrum Mascot arrived way back in June! Oh yeah… I never thought of that! Still, at least that gives us a good excuse to have another celebration party! Congratulations Tantrum! And a commiseration one too - sorry Queasy!